But the long tail is a decidedly mixed blessing for creators. Individual artists, producers, inventors and makers are overlooked in the equation. The long tail does not raise the sales of creators much, but it does add massive competition and endless downward pressure on prices. Unless artists become a large aggregator of other artist's works, the long tail offers no path out of the quiet doldrums of minuscule sales. Assume conservatively that your True Fans will each spend one day's wages per year in support of what you do. That "one-day-wage" is an average, because of course your truest fans will spend a lot more than that. Let's peg that per diem each True Fan spends at $100 per year. If you have 1,000 fans that sums up to $100,000 per year, which minus some modest expenses, is a living for most folks. This small circle of diehard fans, which can provide you with a living, is surrounded by concentric circles of Lesser Fans. These folks will not purchase everything you do, and may not seek out direct contact, but they will buy much of what you produce. The processes you develop to feed your True Fans will also nurture Lesser Fans. 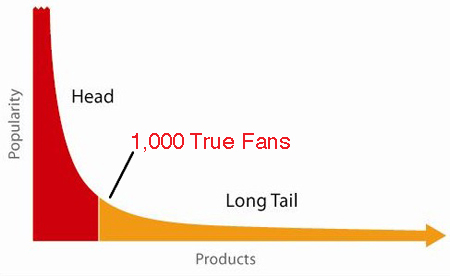 As you acquire new True Fans, you can also add many more Lesser Fans. If you keep going, you may indeed end up with millions of fans and reach a hit. I don't know of any creator who is not interested in having a million fans. But the point of this strategy is to say that you don't need a hit to survive. You don't need to aim for the short head of best-sellerdom to escape the long tail. There is a place in the middle, that is not very far away from the tail, where you can at least make a living. That mid-way haven is called 1,000 True Fans. It is an alternate destination for an artist to aim for.